Jack Milton Freeman died April 6, 2019 at the age of 86. He was born December 6, 1932 in Amarillo, Texas to Walter Murillo and Anna Mae Freeman. He attended public schools in San Angelo, Christoval, and California, and graduated from Merced High School in California. He served in the Air Force during the Korean War. He graduated from San Angelo Junior College, received his BBA degree from Sul Ross State University, and his Master's Degree from the University of Northern Colorado. He taught school in Crockett, Texas and Snyder, Texas, and was a counselor at Lincoln Junior High for many years. He also worked at Texas Employment Commission, where he received a Merit Award from the Texas Rehabilitation Commission in recognition of his outstanding contribution to employment of the disabled. He was president of the Civitan Club, and was former Vice­President of the Sul Russ Ex-Student Association. Jack was also a long-time member of the Southgate Church of Christ. Jack married his wife Vera Brasher on July 10, 1954, and they were married for 62 years. He is survived by their three children: Mark and his wife, Minerva; Debra and her husband, Kurt; and Ronnie and his wife, Tina. He is also survived by their four grandchildren: Jaclyn Freeman, Cody Freeman and his wife, Jennifer, Tanner Freeman and his wife Angie, and Braden Freeman and his wife Tori, and two great-grandchildren: Kaitlyn Freeman and Noah Freeman. He was preceded in death by his wife Vera, his parents, his sister Billie Merle, and by his brothers James Eddie Freeman and Edward John Young. 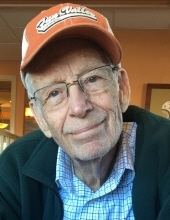 Honoring Jack's wishes, the family has arranged a private burial at Fairmount Cemetery in San Angelo on Wednesday, April 10. The family wishes to thank Kindred Hospice and nurses Theresa and Josh, as well as Comfort Keepers, along with special thanks to Tania, Monica, and Camille for their compassionate care. In lieu of flowers, memorials may be made to San Angelo Christian Academy or a charity of your choice. "Email Address" would like to share the life celebration of Jack Milton Freeman. Click on the "link" to go to share a favorite memory or leave a condolence message for the family.